In the third quarter of 2018, global smartphone shipments declined 5% according to data gathered by Counterpoint Research. But as revealed by their newest report, the premium segment actually grew considerably. Throughout the months of July, August, and September, sales of smartphones valued at $400 or higher accounted for 22% of the global market. This represents an increase of 19% over the year prior. Of the total, Apple's iPhone accounted for almost half of all sales during the quarter. 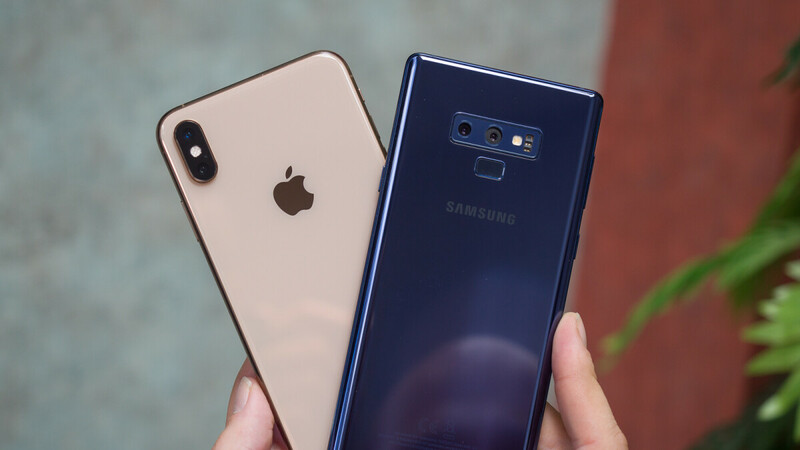 Samsung followed in a distant second with 22% and Huawei in third with 12% – this is the first time Huawei has hit a double-digits. Dividing up the segment by price, Samsung dominated the $400-600 market with an impressive 25% share. Apple and Huawei, on the other hand, sat in second and third place with shares of 21% and 17% respectively. Vivo and Oppo completed the top 5 thanks to their popularity in China, while landing 6th place was Xiaomi with a market share of 6%. Elsewhere in the premium segment, the $600-800 group was unsurprisingly dominated by Apple and Samsung once again with a combined share of 82%. However, only Apple was capable of maintaining its popularity in the $800+ segment. In fact, thanks to last year's iPhone X and the newer iPhone XS and XS Max, Apple's iPhone accounted for a whopping 79% of all sales in this section of the market. Despite not being in the top five on a global scale, Counterpoint Research listed OnePlus as one of the fastest-growing brands in the $400-600 segment thanks to its popularity in India, China, and the UK. Google, on the other hand, also continued to grow its presence in the smartphone market during Q3 – it was one of the top 5 brands in both Western Europe and North America. Another year dominated by Apple. The king of high end. The people have spoken with their wallets, and chosen the better brand. Well deserved Apple, losers always going to hate on the champ. High end in terms of retail price. But average hardware and poor software and services. When I pay premium I expect much more than apple can deliver (with exception of brain cancer, apple excels here, lol). I'd rather buy something that's more capable, reliable, affordable, and doesn't come bent right out of the box...or bricked after a sudden and suspicious update. Huh? Apple makes the best software and great services. Much better software that what their closest rival, google, make. Less than 10 seconds faster when Apple controls the total package and one plus controls very little of it. Not that impressive in Apple's case really. 4GB > 10GB is not impressive ?? Oh it’s just unbelieveable ! iPhone vs Pixel are even worst and Google controls the total package too. So, you believe Apple is lying when they admitted to slowing down their phones? Slow their phone so that it will not crash and this is for phones after 3 years of old. It’s actually after the battery wears down to a certain percentage, not age of the device, but why worry about accuracy? It was for phones after 1 year, not 3 years. Apple consistently leads in crashes, regardless. I still wouldn't think that a high end, premium, it just works, takes their time and gets it right, hardware works with software device would have to use cheap tactics to prevent crashes that still happen more than any other device. And the original comment was about being "fast", thanks for acknowledging that it is intentionally slow, thus proving my point. Nope, it was based on usage which was easily achievable for many within a standard 24 month contract, many of the devices documented were less than two years old, fact. Apple will always be on top regarding premium smartphone sales. No one can touch Apple. Hail apple! Hail apple! The king of smartphones! I will kiss apple hiney everytime there's news about apple market dominance! Nobody can touch our god apple! 2019 and I'm still going with this childish bragging. I'm saving you the time piyath, you can thank me later. You're right. Because this is all Apple sells. If an OEM sells other options, then those lower priced options are gonna be the top sellers. That's why Toyota sells more cars than Ferrari or Mercedes and BMW. Surprise. A company that sells one tier of phones, sold the most in that tier. Great Now who sold the most phones this year, and last year, and the years before? The true king Smaaung who actually has competition on the same platform still sold over 300M handsets at various price point. The true king of Android who actually has competition vs Apple who is the only single iOS handset seller. Yeah. It's so easy to have the highest sales in one category. When that is all you sell os product in one category. And of course an OEM that sells other options, at a lesser price, will sell more options at a lesser price. But based on actual numbers, since Samsung actually competes against other Android OEMs who actually sell tenured devices, Samsung is the true king if premium. No one else sells iOS devices, so Apple isnt king if anyone. And of course you cheerleading Apple being on too. Who are they on top of? No one else has iOS. Apple doesn't sell midrange models or low end models. Apple indirectly competes against Android OEM's in a segment that most only offer one or 2 options. Apple can't beat themselves. "Yeah. It's so easy to have the highest sales in one category. " C'mon man! Where Apple gets their highest sales is the hardest category in the market and from there it's very hard to get sales. Like you see from the article, no business for Android companies. Again as I stated and you can't argue. How many options do you have for an iPhone? One! If Apple had as new phone that costed $500, all other other X models would have sold less than Samsung themselves. Stop fooling yourself bruh. Because only you and your kind are crazy's. Not the rest of us. We aren't stupid like you. Apple is the only seller of an iPhone. If you want one, you gotta pay what it costs. Period. With other OEMs, if you don't want to pay $1000 for a phone, you won't or don't have too. With Apple you have too. Period. No matter how hard the segment is as you claim the issue is simple. If you want to need an new iPhone, Apple is your only option and when you have spent $1000's of dollars you can't just jump ship. Because and unless you only use Google services on an iPhone, if i want to leave iOS you can't take it with you. With Android I can jump from brand to brand and 99% of my stuff works elsewhere. With Apple less than 30% of what you have will work anywhere else. Stop it dude, you aren't even worth the time of day. I'm done with you. Doomed? Apple dominated the 3 largest markets in the world, China, West Europe and US. Apple stocks are going down. They even had the death cross so it's not sarcasm. I heard that every year, yet Apple still dominates. They're definitely not doomed, but they also did not dominate China or Western Europe. Doomed? With that much cash she going no where for next 15 years. She can acquire innovation company. It's amazing so many idiots willing to pay for mediocre overpriced phones from krapple eventhough their tech is so far behind. At least this info shows the stinkin chinese aren't as big and successful as everyone makes it seem. Just a pile of low end junk selling in 3rd world india and china. wherever you live... 3rd world looks like Disneyland.